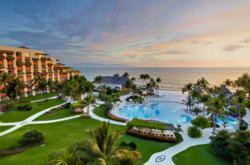 New e-concierge service available for travel agents at the Grand Velas Riviera Nayarit. A new Pre-Arrival Concierge Service exclusively for travel agents is now available at the Grand Velas Riviera Nayarit. This new service offers agents the opportunity to handle any and all bookings, questions and issues that may arise for clients prior to arriving at the resort. The E-Concierge is also able to set up reservations at any of the resort’s AAA Four Diamond restaurants, local dining options, transfers, private dinners, spa appointments, destination activities and more. A service that is free of charge, the e-concierge can be reached via telephone and or email, seven days a week. Hotel reservations are commissionable to agents at a rate of 10%. Tel: +52 (322) 2268918. Email: econcierge(at)grandvelas(dot)com.